Directed by Kim Nguyen, and featuring breathtaking images shot on location in Nunavut, Two Lovers and a Bear is a hypnotic and transportive psychological drama, that balances its elements of magical realism with genuine human emotion. 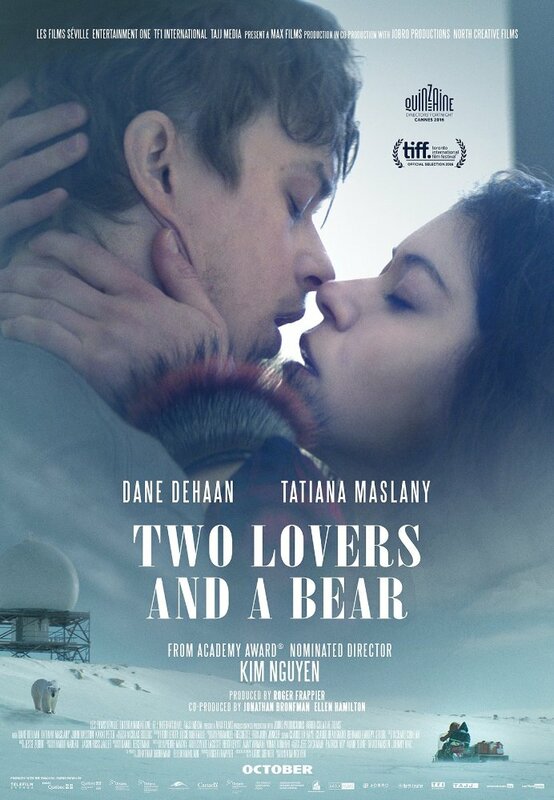 The two lovers of the title are Lucy (Tatiana Maslaney) and Roman (Dane DeHaan), a young couple living in the far reaches of the Canadian Arctic, both facing depression and trying to run from traumas in their past and the demons inside their heads. The film is anchored by a pair of nuanced performances from Tatiana Maslaney and Dane DeHaan, who are both gripping to watch and share resonant chemistry together, grounding the story throughout even its most magical realist touches. This includes the titular polar bear (Gordon Pinsent), who has hallucinatory philosophical conversations with Roman. These offbeat tonal shifts, oscillating between moments of whimsy and the nightmarish elements of a thriller, are handled seamlessly throughout to give it an almost dreamlike feel, and the film also features one of the best ever uses of the White Stripes song “Seven Nation Army.” Emotionally affecting and undeniably unique, Two Lovers and a Bear is a gripping portrait of mental illness in one of the harshest climates on earth, that builds towards a suspenseful and haunting last act. Two Lovers and a Bear is now playing in limited release at Varsity Cinemas in Toronto.